Marion County seems to have tasty water as it has been deemed the county with the best tasting water. The Florida Rural Water Association gave Marion County the title after a panel rated Marion County’s water based on color, taste, and quench factor. The panel is made up of individuals from the Florida Department of Environmental Protection and water supply companies and Marion County was chosen out of more than a dozen competitors. Marion County Utilities will be up against the rest of the country in February for the Great American Water Taste Test in Washington, D.C. It is unclear where the water came from that was entered into the contest. Was it chlorinated or directly from the aquifer? The facts about chlorine are undeniable and the public should not be misled, rather it be intentional or unintentional. We were able to obtain water from three separate communities; Marion Oaks, Silver Springs Shores, and Sun Valley. We found the water tested high in chlorine levels. We used a simple pool test kit to test the levels and Marion Oaks proved to be higher in chlorine than that of Silver Springs Shores and Sun Valley. Nevertheless the presence of chlorine in the water straight from the glass, was noticeable in both taste and smell. The [Floridan] aquifer is a portion of the principal Artesian Aquifer that extends into Florida. While the reasoning behind chlorinating water is understandable, after doing a lot of research it can be concluded that chlorine is actually quite dangerous. Maybe even more dangerous than that of the natural water that would come from the aquifer untreated. * Chlorine can react with water in the mucous of the lungs to form hydrochloric acid, an irritant that can be lethal. * When chlorine enters the body as a result of breathing, swallowing, or skin contact, it reacts with water to produce acids. The acids are corrosive and damage cells in the body on contact. Individuals may have experienced many of the side effects, been to the doctor, but never knew the cause. Someone may have even developed cancer but had no idea it was caused from chlorine. Cancer cases have grown over the past two decades. Does anyone ever ask the question why? The side effects make sense. 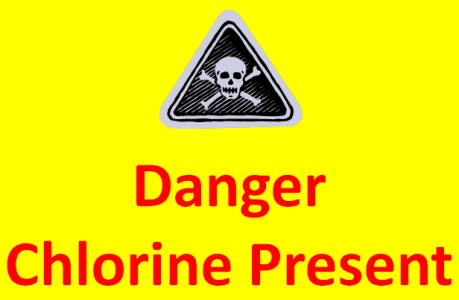 Chlorine is a corrosive, an agent used to kill bacteria, mold, algae, and used to pressure wash houses. If households use bleach, which is weaker than chlorine, to wash whites; it makes one wonder what chlorine does to a person’s insides. If your household is supplied water from a utility company and not a well in your backyard, here are some suggestions. *If your refrigerator has on-board water and filter, make sure it is changed as directed by the manufacturer. The filter will filter out the chlorine in the water. *If you do not have a refrigerator that has a filter there are inexpensive alternatives to protect your family. Brita water dispensers are a great alternative. They range from $10-$70 and will help filter out the chlorine in your drinking water. The money will be well spent and could prevent health problems down the road for your family.